Rodents and rabbits share numerous derived characters of the skull and dentition, such as the large open-rooted incisor teeth. This and other shared characters have suggested that rodents and rabbits are grouped together as the clade Glires (Novacek et al., 1988; Meng et al., 2003). Molecular evidence for this grouping was at first mixed, but it is now generally accepted (see Box 10.6), although one recent study failed to confirm the mono-phyly of Glires (Misawa and Janke, 2003). The success of the rodents is legendary. They are a diverse and widespread order of mammals with just over 2000 living species (40% of all living mammals). Their adaptability seems to know no bounds, as can be seen from the way in which mice, rats and squirrels have modified their behaviour in order to coexist in a human landscape. Rodents are characterized by their extaordi-nary teeth and jaws, which formed the basis of their rapid evolutionary radiation. Rodents have deep-rooted incisor teeth, one pair in the upper jaw and one in the lower, which grow continuously throughout life, an unusual feature among mammals. In cross-section a typical rodent skull (Figure 10.42(a)) seems to be largely occupied by the deep open roots of the incisors that curve back round the snout region and fill up most of the lower jaw. The incisors are used to gnaw wood, nuts, husks of fruit and so on. They are triangular in cross-section and bear enamel only on the front face, so that the dentine behind wears faster and gives a sharp enamel cutting edge. Behind the incisors is a long diastema, a gap representing the missing second and third incisors and a canine, followed by at most a single premolar and three molars. In many forms the molars are hypsodont (high-crowned) or hypselodont (ever-growing). 4 myomorph,seen in rats and mice, in which the middle masseter is attached in front of the eye (as in sciuromorph) and the deep masseter passes up into the orbital area and through the infraorbital foramen. The four muscle patterns appear to have arisen independently several times and (except for myomorphs) they do not characterize unique monophyletic groups. Equipped with their ever-growing incisors and powerful low-angle masseters, the rodents have chewed their way through wood, tough plant fibres and nuts for the past 60 Myr. The first rodents, the ischyromids of the upper Palaeocene and Eocene of North America and Eurasia, such as Paramys (Figure 10.43(a)), show primitive characters in the protrogomorph jaw muscle pattern and in the teeth. 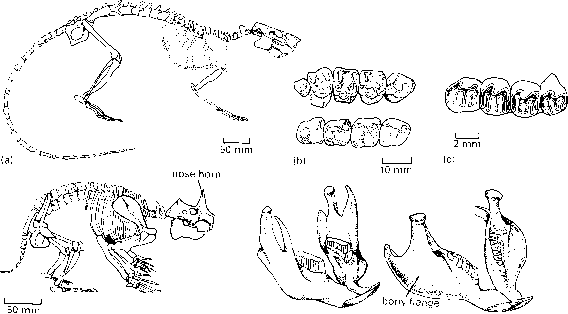 The cheek teeth (Figure 10.43(b)) still have mound-like cusps instead of the ridges of some later rodents (Figure 10.43(c)) and the last molar is not fully part of the grinding dental battery. Miocene of the Great Basin, USA. 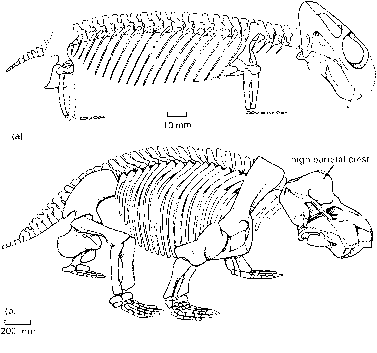 Epigaulus (Figure 10.43(d)) has broad paddle-like hands with long claws, used in digging, and small eyes, so it probably lived underground in burrows. It has a pair of small horns on the snout just in front of the eyes, whose function is a mystery, unless they were used in pre-mating fights; not all specimens have the horns, so they may have been restricted to males only. Alternatively, the horns might have been used for digging. Paramys, and most other Eocene rodents, have a primitive jaw arrangement in which the area of attachment of the masseter muscle on the dentary is a vertical surface in the same plane as the incisor tooth. This is the sciurognathous jaw pattern (Figure 10.43(e)). A second pattern is seen in porcupines and the South American rodents in which the masseter insertion is deflected outwards,the hystricognathous (Figure 10.43(f)) condition, that seemingly arose once only. and include today the Sciuromorpha (squirrels and beavers) and Myomorpha (dormice, hamsters, mice, rats and voles). The Sciuromorpha date back to the early Eocene, with the oldest squirrels and beavers being late Eocene in age. While modern beavers are known for their dambuilding and tree-felling activities, some fossil forms excavated remarkable burrows. Large helical burrows named Daimonelix have been known for some time from the Oligocene and Miocene of Nebraska, USA. They extend to 2.5 m deep and have an upper entrance pit, a middle vertical spiral and a lower living chamber (Figure 10.44(a)).The burrow diameter is constant and the helix may be dextral or sinistral in the same locality. 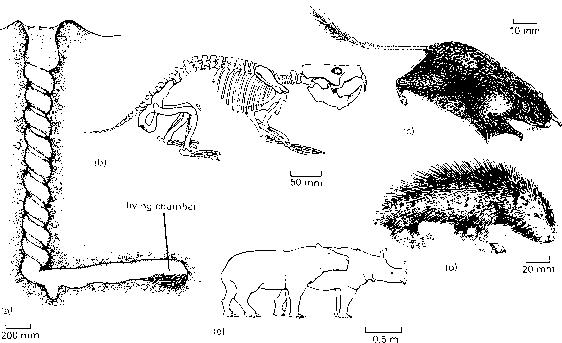 These burrows have been ascribed to Palaeocastor (Figure 10.44(b)), an early beaver, on the basis of complete and incomplete skeletons found in the living chamber (Martin and Bennett, 1977). The myomorphs arose in the early Eocene, but they radiated dramatically from the Miocene onwards. The eomyids were important early myomorphs, known from the middle Eocene to the Pleistocene of Europe, Asia and North America. Fossils from the oil shales of the Oligocene locality Enspel in Germany include perfectly preserved examples of Eomys with skin and hair, and these show that it was a gliding form (Figure 10.44(c)) with a narrow skin membrane along the side of the body and between the hindlegs (Storch et al., 1996). This is not the only gliding rodent group: others include certain modern squirrels (Sciuridae), scaly-tailed flying squirrels (Anomaluridae) and dormice (Gliridae). But for the exceptional preservation, there would have been little clue that Eomys was a glider too.